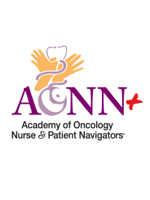 At the Academy of Oncology Nurse Navigators (AONN+) 4th Annual Conference in November, one outstanding nurse was recognized by her peers for her dedication and commitment to the profession. The 2013 ONE Award winner was Libby Daniels, RN, OCN, from Lexington Medical Center in West Columbia, South Carolina. In a phone interview held after she returned home from the conference, Ms Daniels reflected on the case that led to her nomination. “My colleague’s grandfather had recently been diagnosed with stage IV lung cancer. They were having some family dynamics going on about whether to do treatment or not. I basically said to my colleague, ‘That’s what I do. I’m a nurse navigator. I can meet your family, be the mediator, and explain all the pros and cons of the different courses of treatment for you.’ We held a family meeting where we let each family member talk about how they felt and what they thought would be best for their loved one,” she explained. “In talking to her grandparents, I found that he wanted to try chemotherapy for his family. Through the process of talking to and getting to know the family, one of the main goals that I learned her grandfather had was that he and his wife were soon going to celebrate their 60th wedding anniversary. There was a particularly heart-wrenching moment when the grandfather asked her, “Can the chemotherapy cure me?’’ and Ms Daniels had to tell him that it would not. That’s when the 3 of them—the patient and his wife and Ms Daniels—talked about his goals and how important his quality of life was to him. Ultimately, his “treatment goal” was to be married for 60 years. “I went back to my colleague and I said, ‘I really feel like the reason why he’s doing this chemotherapy is because he’s got a goal. His goal is to be married for 60 years.’ He ended up doing the treatment until he reached that goal, and he passed away on the day of their 60th wedding anniversary,” Ms Daniels reflected. Anyone can imagine what that experience would be like for the family of that patient. But what was that experience like for the nurse who navigated that patient to the end of his life, a patient who passed away on the very day of his 60th wedding anniversary? “When you’re in your 80s, you know life can come to an end, but life isn’t always about our lifespan. It’s about reaching goals and fulfilling dreams. That was the closest goal that he knew he was going to be able to reach. That was very important to him,” Ms Daniels explained. “It was very emotional for me, because my parents are not much younger than he and his wife. I know what it’s like to have spent that many years with someone. You’re celebrating spending your life together but at the same time you’re saying goodbye to one another. That’s very difficult,” she said. In addition to the plaque she received at the conference, Ms Daniels will be given $250 to donate to a charity of her choice. She’s chosen the Lexington Medical Center Foundation. The foundation, which recently celebrated its 20th year of operation, is funded by the medical center’s employees. The hospital holds fundraising events such as Women’s Night Out and Cancer of Many Colors, where money is raised to help not just patients with cancer but any patients within the hospital’s community who might need assistance. It even helps with employees who may have had a hard time or have gotten really sick. “A big part of the foundation’s success is because of employees giving back,” Ms Daniels explained. Congratulations to the 2017 ONE Award Winner!